Have you got one of these too? 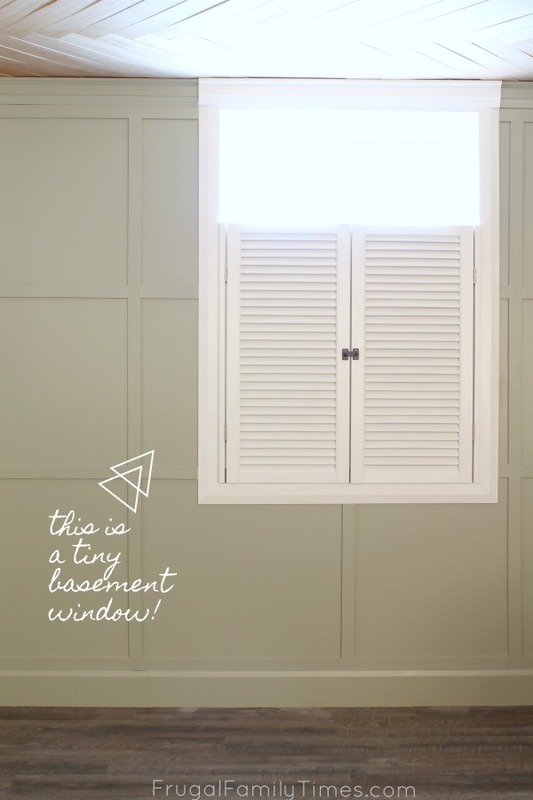 A basement room with a weirdly small and awkwardly high window? If you have a below grade basement, chances are you do. It's so frustrating - how do you make it look less odd?! 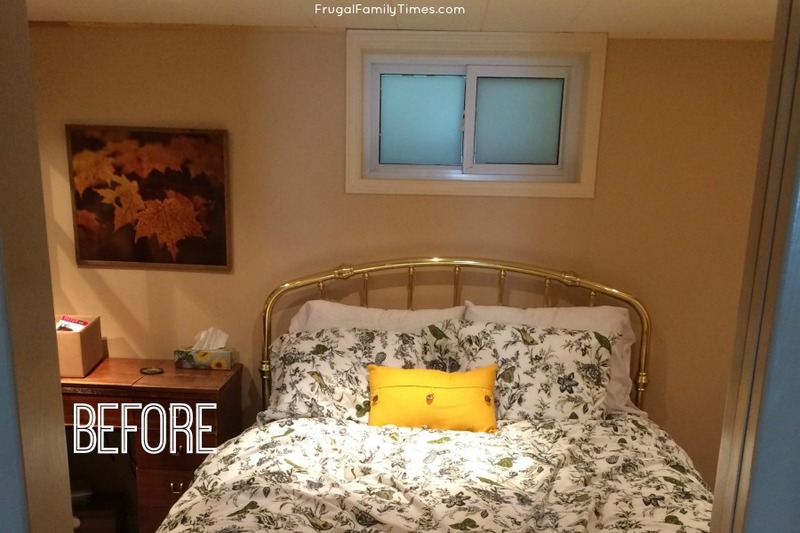 I can't wait for you to see what we did to solve this problem in our basement guest room! With just trim and cheap bamboo blinds, we made this odd little basement window look - dare I say it - beautiful. And it was so easy! Can you believe that's the same space? 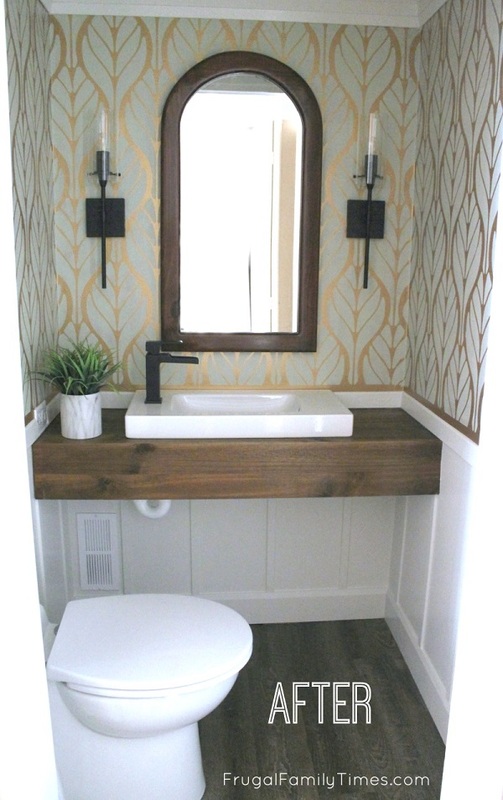 I'm thrilled with how this room turned out! That's still the same single, tiny window - we didn't add any windows - that's definitely not in our budget! 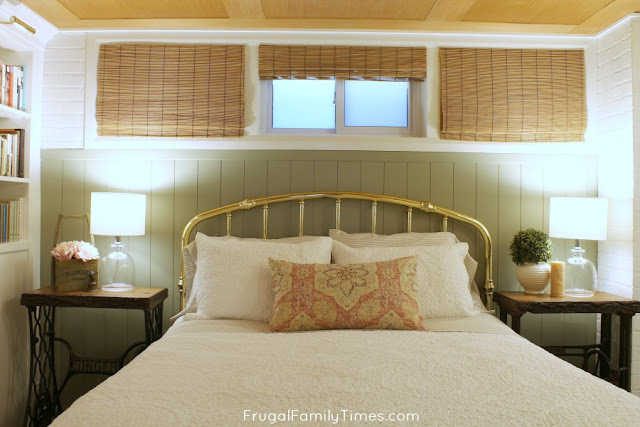 The faux windows help this room feel like it's upstairs. The pillow I made using this fabric. 1. Frame the faux windows with trim. We could only make our faux windows as wide as the wall on the right. Can you notice that the faux windows are slightly smaller than the real one? I hope not - but it's the best we could do. 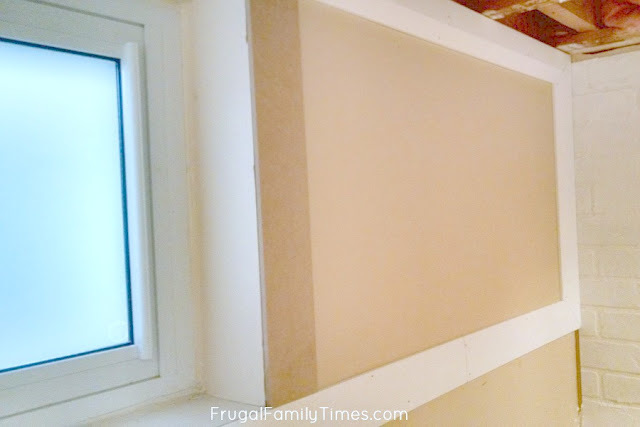 Using MDF that is the same depth as the window casing we trimmed the sides of the real window. 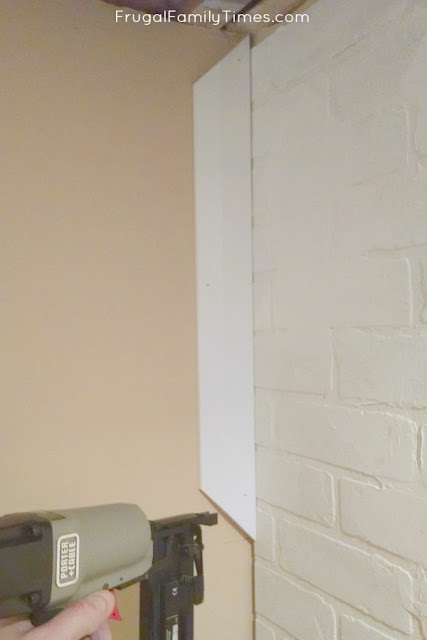 We nailed it in place and caulked the gaps. 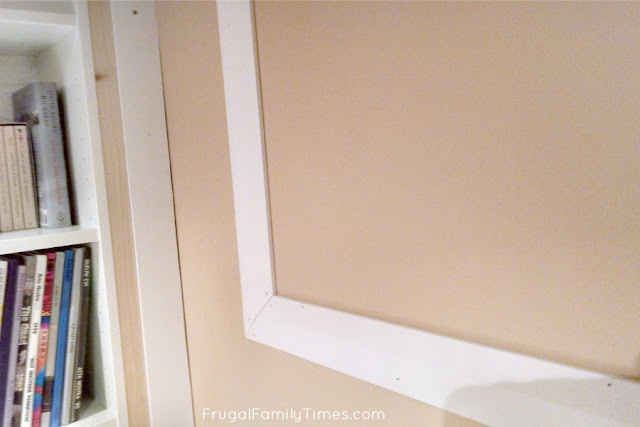 We copied the exact same faux window - the same size - on the other side. The finished box. It still needs paint. That's all it is - one large box vertical trim in the middle section. 2) Remove the hardware from the blinds. This is why you want cheap bamboo blinds! You're going to take them apart. I did this by just untieing the strings from the hardware and then retying the knots up against the bamboo. 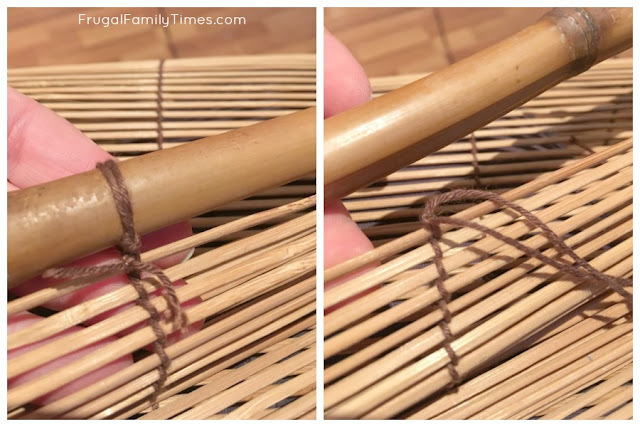 Do this carefully - the blinds' strings are simply woven around the bamboo - they will fall completely apart if you don't retie the knots. 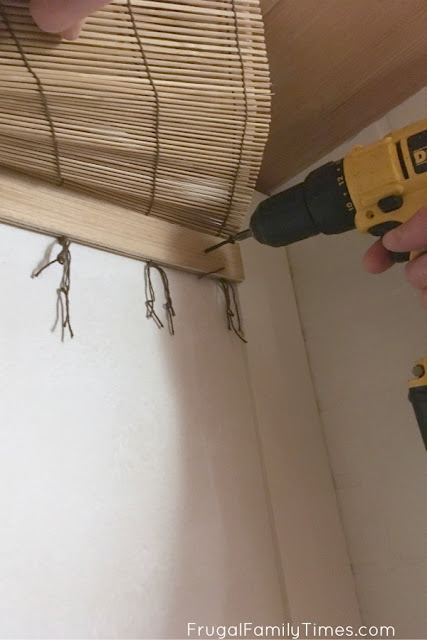 3) Cut the new header/top piece for the blinds. 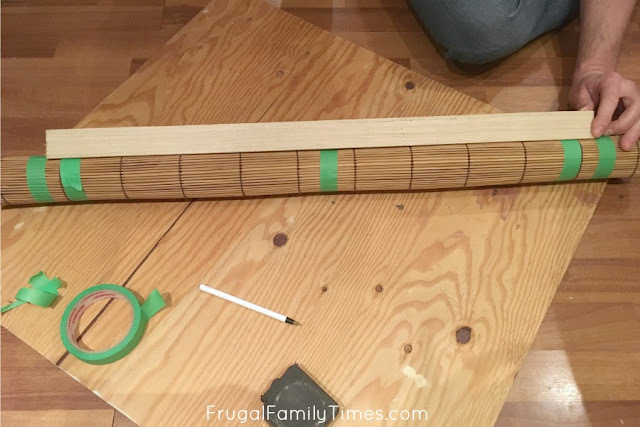 This header piece is important - it's how you'll attach the blinds to the wall. It's about 1/4" thick - and we cut it to the same length as the gap between the trim for all three windows. 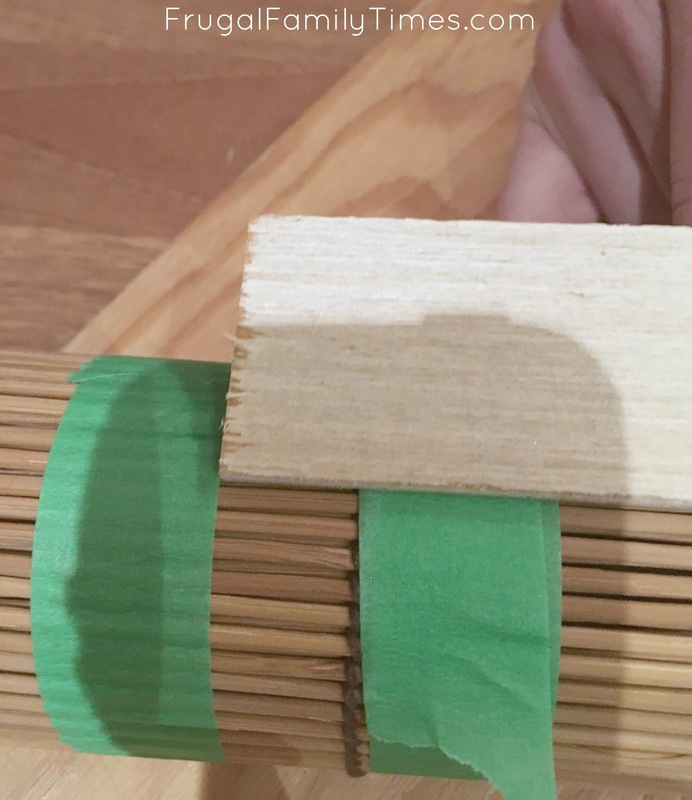 The green tape you see above marks the centre and where the cut will be to make the bamboo the right width. 4) Cut the blinds to size. 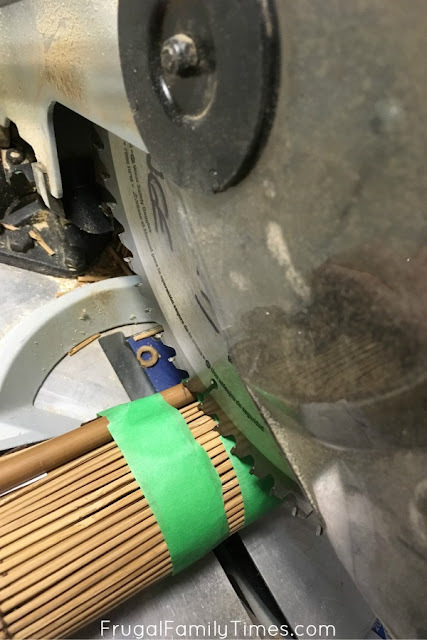 Be very careful - you want to measure from the centre to the sides - you want the strings that hold the blinds together to be centred and cut evenly. There are two pieces of tape to hold both sides of the cut together - wrap the tape as tight as possible before cutting to avoid splintering and messy ends to your cut. We held our breath when we made the cuts. Remember - you can always cut them smaller - you can't cut them bigger! Err on the side of making them too big and then do more cuts to perfect it. 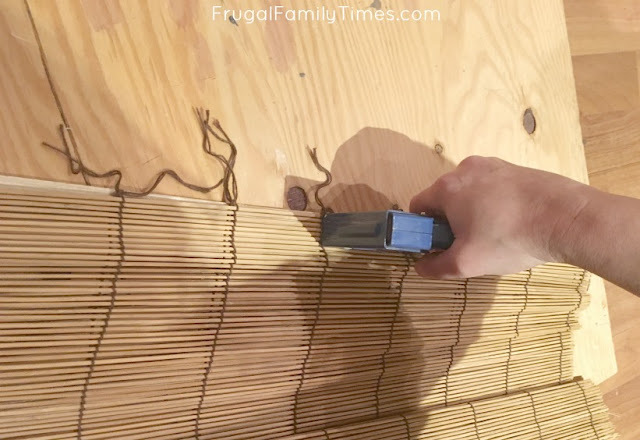 5) Attach the blinds to the top piece/header. I folded the blinds in half and tied the strings together. Then stapled both sides to the header. 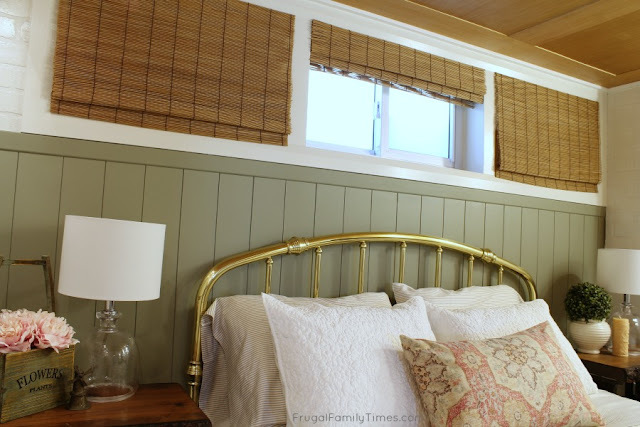 6) Attach the blinds to the faux window frames. 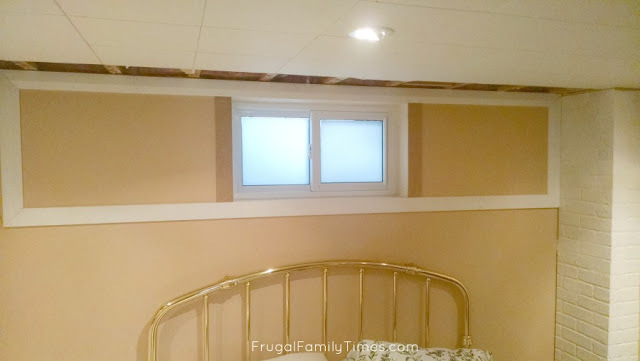 We screwed the blind header to the inside top of the faux window area. 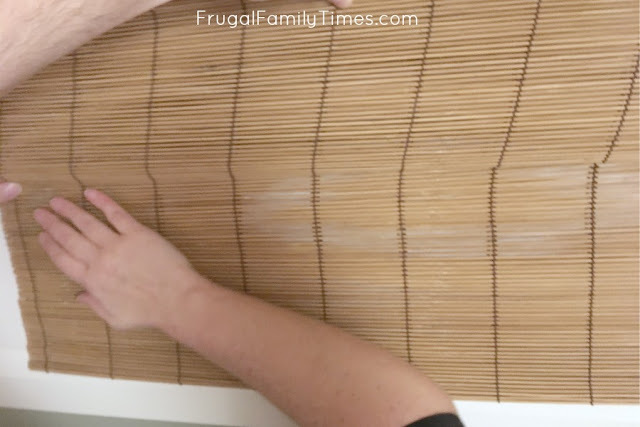 7) Make the bamboo look folded like roman blinds. Here's how I made them look like they were closed roman blinds. 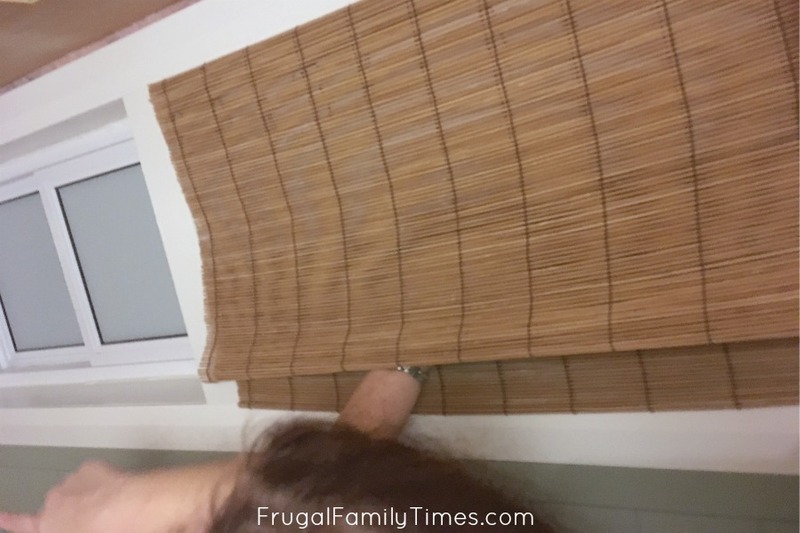 I carefully made sure the blinds were evenly folded in half (basically let them hang down evenly). I held the bottom fold and pulled them up even with the bottom window trim. Then I just stapled them in place. Next I adjusted the top fold until it looked just right. Then I reached up and stapled it in place. The beauty of staples - you can pull them out and redo it until you're happy with it. Which I did, of course. Love that! 8) Repeat the process for the other 2 windows. For the left faux window, it was the exact same process. I can't get enough of this Before and After! This whole room is beautiful and I just love what you did with the window. It makes the room look bigger and brighter. Awesome DIY project. I had no idea that wasn’t three windows!! So smart! What a brilliant 'trick'!!!! Makes such a difference. You are so clever to have thought of that and there are so many situations where that 'trick' can come in handy. This is such a great idea. You made it less like a basement and more like a cottage or beach house! A lovely space, for sure! Great idea. What a difference the "designing" made to the window. I'm keeping this idea in mind for future. Thank you. hey girl! i love what you did with the window(s!) but am super impressed with the ceiling...did you go right over the ceiling tiles with the new look? I ask, because i have the same ceiling tiles, and abhor them! 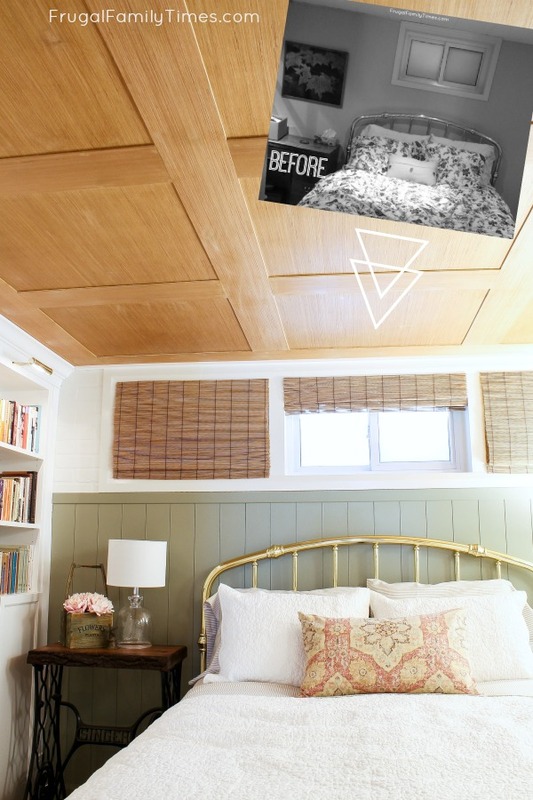 How did you do your ceiling? The entire room looks fantastic, that ceiling is amazing but the window hack is genius!